Increasing infrastructure redevelopment activities and large scale investments in the oil and gas sector coupled with growing demand for IT infrastructure due to increasing population are the prime factors that have led to the growth of UPS market in Iraq. Currently, Iraq UPS market share is dominated by low KVA UPS in volume as well as revenue terms on account of their high consumption in commercial offices, hospitality, BFSI, etc. Commercial sector is the major consumer of UPS systems in the overall Iraq UPS market followed by industrial sector. Upcoming projects in commercial offices, data centers, healthcare, BFSI would generate more demand for UPS systems in the coming years. Additionally, improvement of oil & gas and water treatment plants are also anticipated to surge UPS demand in the forecast period. 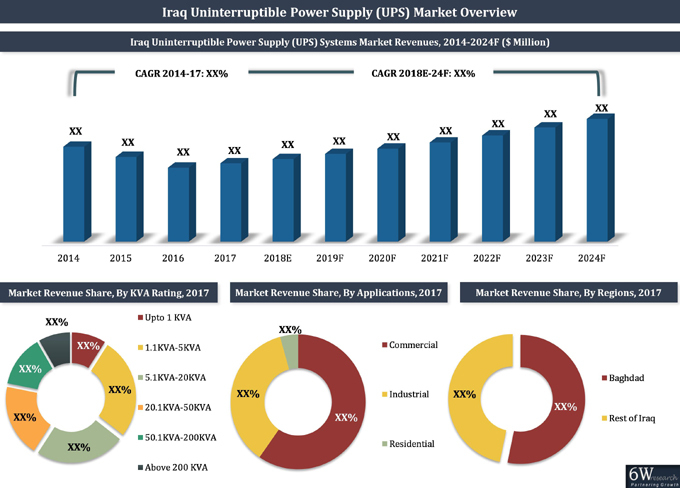 The Iraq UPS market report thoroughly covers the market by KVA ratings, applications and regions. The Iraq UPS market outlook report provides an unbiased and detailed analysis of the Iraq UPS market trends, opportunities/high growth areas, market drivers which would help the stakeholders to device and align their market strategies according to the current and future market dynamics. 13.2 AEG Power Solutions B.V.
13.6 Schneider Electric East Mediterranean S.A.L.